Movies have been made about World Word II pretty much since the war ended and there have been near countless ones produced. Zombie movies have been around for even longer and it's getting increasingly more difficult to find something unique to do with both of these genres. So why not throw them both in a blender with a big budget and see what happens? Such is the case with Overlord, which winds up working out as a great WWII movie that just so happens to have zombies in it. It's an entertaining and thrilling combination. Overlord, which recently held its world premiere at Fantastic Fest, centers on a team of American paratroopers who are tasked with dropping into Nazi-occupied France just hours before D-Day in order to carry out a very important mission that's crucial to the success of the invasion. The group is tasked with destroying a radio transmitter so that the Allies will be able to provide the troops on the ground with air support. Unfortunately, things don't go according to plan and the group of soldiers is whittled down to a small handful who must take on this task themselves. Desperate, scared, yet determined, they join up with a young French woman who aids them on their treacherous journey. Things get extra complicated when they discover a mysterious Nazi lab at the location of this radio transmitter. Outnumbered, outgunned and overmatched, the group will have to face down enemies the likes of which no man has ever seen in order to win the day. It's interesting heading into a movie such as this. One might think the idea would be to get to the sci-fi zombie stuff as quickly as possible. That doesn't really turn out to be the case. This isn't so much something that should be perceived as a spoiler as it is a way to set expectations. Through and through, this is a get up and go, men on a mission war movie. Even without the sci-fi element in play, this would work as an incredibly effective WWII drama. It's filmed as such and carries the dramatic stakes and tension of just such an exercise. But then the whole zombie business is sprinkled in, never overused, to give it that extra little something. This, strangely, isn't the first war movie to have zombies in it, but it's probably the best. J.J. Abrams and his Bad Robot production company put together Overlord and it is overflowing with his sensibilities. It's actually quite easy to see why many thought this was going to wind up being a Cloverfield movie, and probably could have very easily be turned into one. However, it works much better as its own thing. It's mysterious, action-packed, funny, rousing and purely enjoyable. All things we've come to know and love Abrams for packing into his productions. But that's not to take anything away from director Julius Avery. While Abrams gave him the ball to run with, and surely some guidance along the way, Avery establishes himself here as a man who carries a certain edge. A certain bite that Abrams hasn't quite displayed in his own directorial efforts. Avery was the perfect guy to bring the R-rated goods to Bad Robot for the first time. As with any great war movie, the group of soldiers we're following is crucially important. In that respect, this movie absolutely nails it. Jovan Adepo is our mysterious protagonist; Wyatt Russell who, for the first time, carries the early swagger of his father, Kurt Russell, is their gritty and fearless leader; John Magaro is the wisecracker and Iain De Caestecker is the fearful, witless tagalong. The group gels perfectly and every single one of them is taking the material with absolute seriousness. There isn't really much tongue in cheek, which is why this movie doesn't fly off the rails once the zombies come into play. It's just terrifying tall tales of secret Nazi experiments come to life. 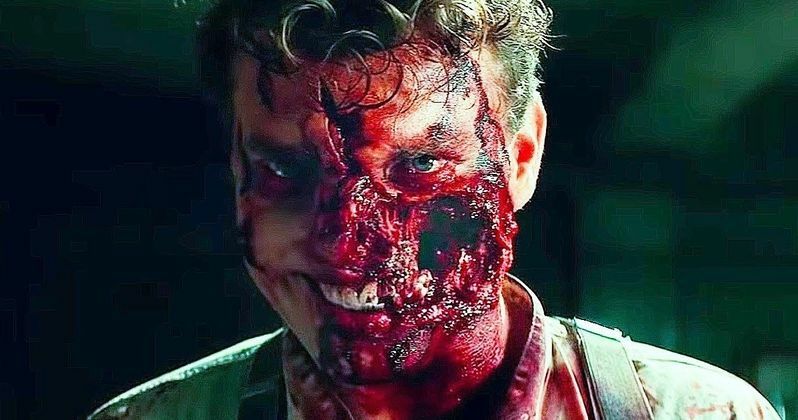 The story for overlord was cooked up by relative newcomer Billy Ray and it feels like the kind of thing that could have very easily been written off as bananas and turned into a SyFy original movie. Instead, they took that story, handed it to one of the most prolific producers in Hollywood, paired Ray with an Oscar-nominated screenwriter in Mark L. Smith and gave the movie a huge budget. That's what Overlord feels like. Something that is, but should not be. But we should all be very happy that it is. Paramount hit the jackpot with this one.